The Weekend was starting off superbly. 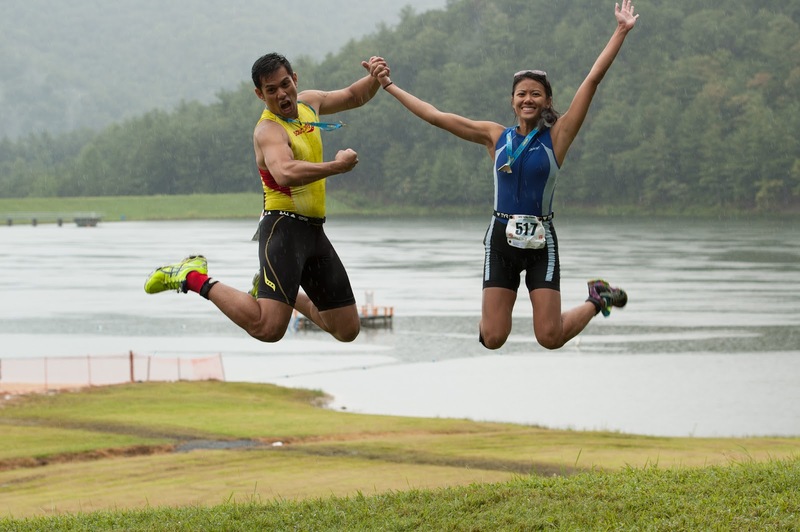 It was the Saturday before the Luray Sprint Triathlon and we were in Basye, Virginia. The sun seemed shy, occasionally peeking through cloudy skies. My girlfriend Jania and I just finished up a short open water swim tune up. We chose Basye/Bryce Mountain as our headquarters for the race. 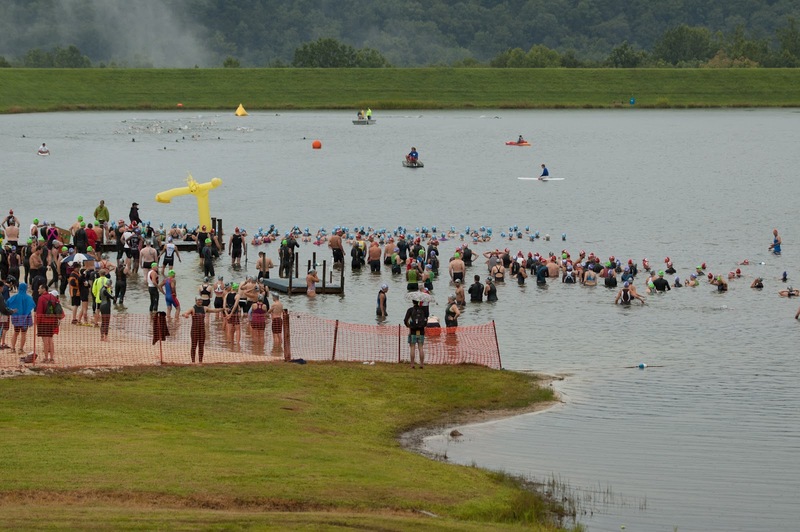 It’s a small resort town about 30 miles from Luray, and it boasts a local lake, Lake Laura, for open water practice and challenging terrain for hill climbs by both foot and bike. That place has been a great training site for us all summer. But this wasn’t any other Saturday. It’s the Saturday before a race. Jania exhibited jitters all day, worrying about everything from the water temperature at Lake Arrowhead (where the race was being held) to the bike climbs and the run course (she hadn’t run in two weeks due to recurring runner’s knee symptoms). We picked up our race packets that afternoon, and her nervousness subsided somewhat when we scoped out the race site and drove the bike course. The water was pretty warm and it seemed like Sunday would be perfect day to compete in a sprint triathlon as long as the rain stayed away. The Morning arrived and the rain, as it turned out, did not stay away. We awoke at 5am, had hard boiled eggs and bagels for breakfast, and packed up the Xterra. 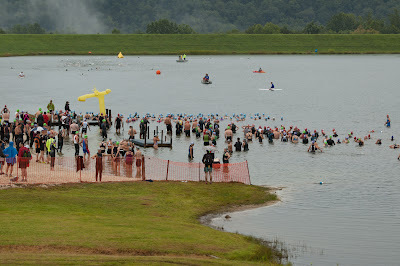 The temperature outside was hovering around the low 60’s, and the persistent drizzle was a little disheartening because our last sprint triathlon, the Giant Acorn in 2012, began the same way. Asking for a sunny day with warm water temperatures is too much to ask, I guess. After hurriedly setting up our transition area, picking up our championchip timing sensors, and getting marked, we made our way to the start. I had time for a few warm up lengths in the 76-degree water before basking in hype music over the loudspeaker before the countdown began. The Swim starting horn blared and immediately I found myself wading behind several slower swimmers. I immediately regretted my decision to line up behind them at the start. After about 5 or 10 seconds (which felt like a lifetime), I decided to aggressively sprint past them. The first couple buoy markers of the triangular course were very visible, and, due to my swimming background, I naturally found myself near the front after the first turn. Following that first turn I set myself into a groove, tried to lower my adrenaline-enhanced heart rate, and focused on technique. The swim finish was difficult to spot while swimming. They used a tall, skinny air balloon man to mark the finish, but I had trouble keeping my line straight. Several times I broke my stroke to figure out where it was, and other times I was just following the swimmer ahead of me. I made it to the beach and began unzipping my wetsuit. 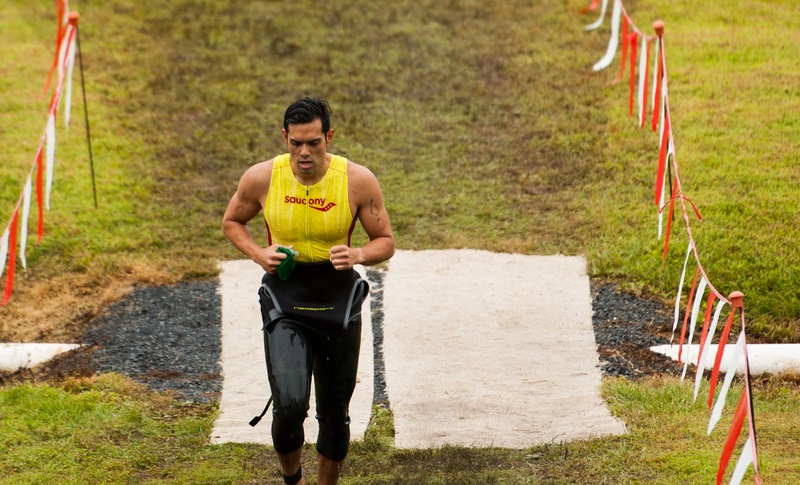 The water was warm and the wetsuit was definitely overkill at these temperatures, but I used this triathlon as practice for a future race, the Savageman 30.0, where I’m expecting the water to be closer to 70 degrees. 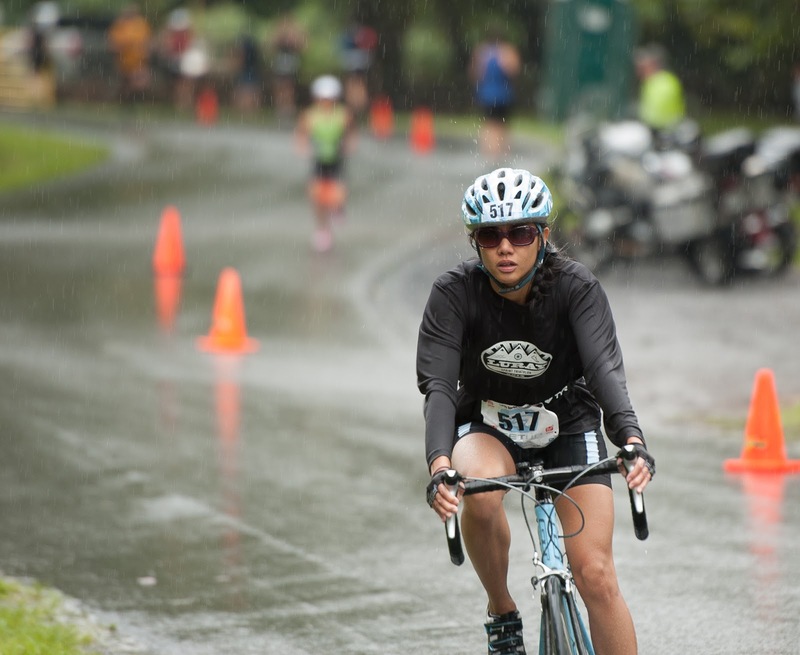 Transition 1 is always tricky in the rain. Before the race, I wasn’t sure if I was going to need additional warmth for the bike because of the rain, but I decided my tri suit was enough. I did choose to wear socks on the bike, however, so putting those on slowed my time a bit (I usually ride sprint distances sockless and put on shoes while already mounted on the bike). My race number 60 provided a fantastic transition spot near the T1 exit and the T2 entrance so I wouldn’t have to run with my bike very far. The Bike began with the consumption of a peanut butter-flavored Gu gel and a higher cadence to help with the switch. 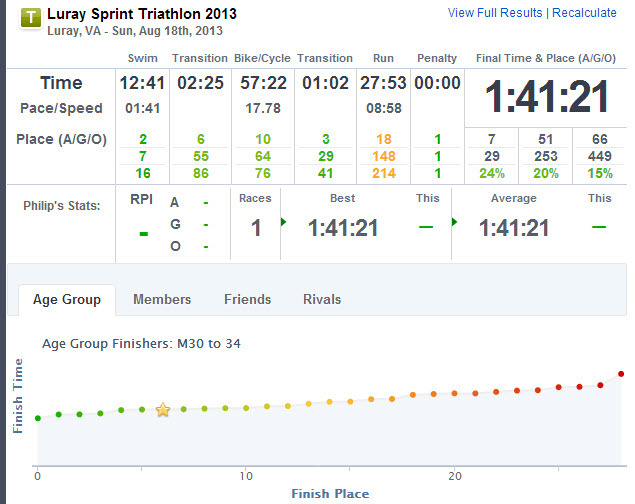 I didn’t feel particularly fast at the beginning of the 17-mile course, but definitely improved as time elapsed. I did, however, make a mistake of tweaking my bike the night before the race without testing it: I added a barrel adjuster to my front derailleur cable housing with hopes of fine-tuning my shifting during my ride. This backfired, because I didn’t tighten the cable enough and thus I was unable to use the left shift lever to get into the big chainring. I resorted to manually pulling on the bare shift cable on my downtube to get the chain to jump. Another no-no that I committed was trying new equipment on race day. 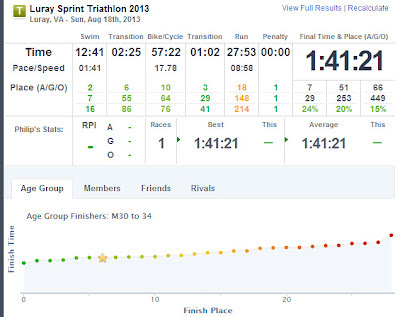 I demo’ed an ISM Adamo Breakaway saddle from Tri360 in Arlington, and this race was the first time I was trying it. I’ve tried ISM Adamo saddles before, so luckily this experiment didn’t have any setbacks. Anyhow, it was still raining, which wasn’t a bother until the descents had me going beyond 45 mph. At that speed the rain felt like needles and keeping my eyes open was a challenge. Of all the random things I purchase for triathlon events, you’d think a pair of sunglasses with clear lenses would be on my list. Another issue with the rain is the confidence I lose in my brakes. The pads on my bike are fantastic in dry conditions but near worthless when wet, so I exercised great caution during turns and descents. Because of the climbs I’m expecting for the upcoming Savageman race, I was riding a road geometry Felt F-series bike featuring traditional drop-down handlebars with clip-on aero bars and a Profile Design FastForward seatpost. I’ve made myself believe this is an easier machine to climb in because shifting is in a more accessible place during extended climbs off the saddle (as opposed to tri bike shifting at the ends of the bar extensions). However, since it’s equipped with the FastForward seatpost, the cons of descending felt similar to descending on a tri bike. As far as my bike leg went, the effort was there, but much could have been improved. 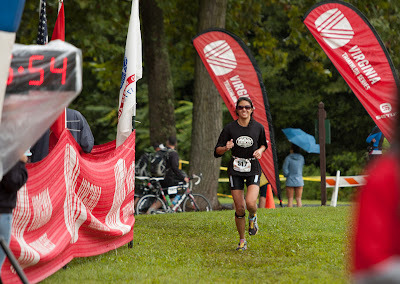 Transition 2 is always an easier transition for me, but I realized I forgot to remove my helmet halfway through the transition area. I snapped it off, spun around to return to my spot, but decided against it, and just threw it on the ground. A nice race volunteer yelled to ask what my race number was. I yelled back, and she grabbed my helmet and put it with the rest of my stuff. I thanked her as I ran out of the transition. Crisis averted. The Run began with small pulsing cramps in the lower hamstring area. A few more brick workouts and this could’ve been avoided. They didn’t last long, but as soon as those went away my stomach felt like rocks! 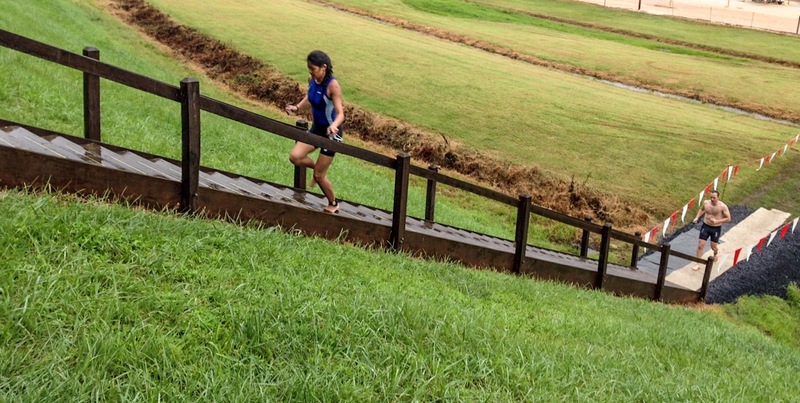 I don’t know if it was a typical side stitch or indigestion, but I was second-guessing everything from my nutrition to my hydration and training. A friendly competitor saw me agonizing, and yelled to me, “Push through it!” as he was passing me (at this point I was ‘jogging’ at a snail’s pace) which provided valuable motivation. After chugging some Heed and water at the first station a mile in, the tummy cramps/indigestion/whatever subsided so I picked up my pace and it was smooth sailing from there. The run was a bit of a disappointment, but that’s a typical trend for me. My proposed solution: train harder! The After-Party was frigid! After the race ended and my body stopped moving, it proved difficult to stay warm. 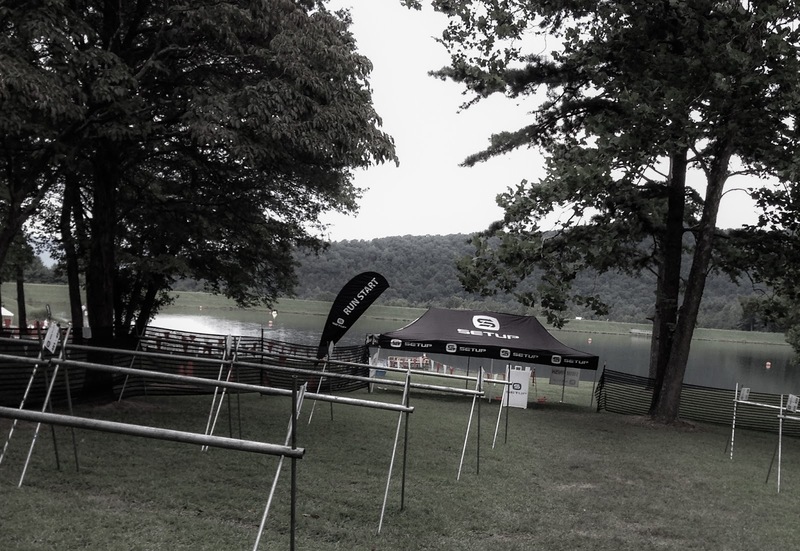 Setup Events didn’t provide us those foil blankets they gave out for the Lake Anna sprint last year, so I was stuck in my wet tri suit and the wet sweatshirt I left in the transition area. I considered just throwing on my wetsuit for warmth! The euphoric high kept me warm and happy. And the pizza, fruits, and snacks didn’t hurt. I cheered Jania on as she came in and finished her race strong. My gang skipped a sampling of ‘Virginia’s best burger’ that local restaurant Artisans Grill boasts, went back to the headquarters and celebrated our tri completion with a nice long nap. Thank you Mike Ventura for taking photos of our event!